A Chocaholic’s Dream! All this guilt-free chocolate in one money-saving bundle! 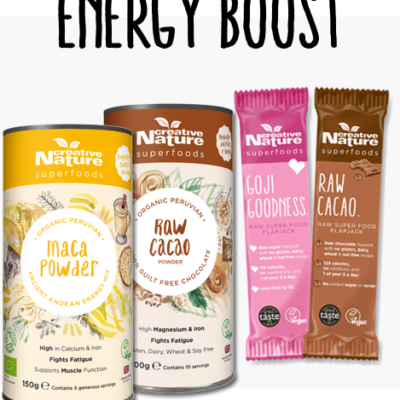 We’ve taken all our cacao-packed products and popped them into a tidy bundle to help save you money, yet still indulge in the good stuff! 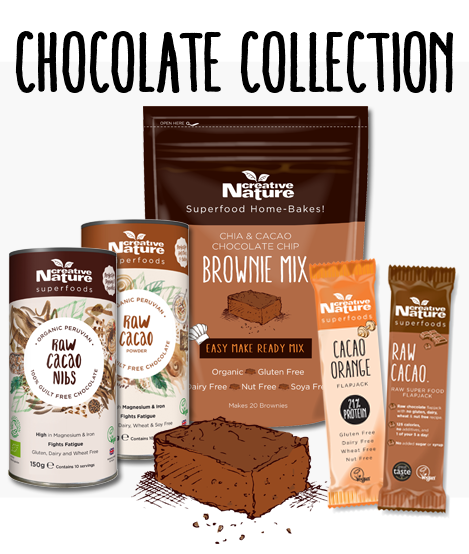 The Creative Nature Chocolate Collection is specifically created for everyone and anyone who loves Chocolate, experimenting with creating new recipes as well as those on the go who need a midday pick-me-up courtesy of our Cacao Orange Protein Bar and Raw Cacao Superfood Bar! Organic Cacao Nibs 150g – Perfect on porridge, muesli or ice-cream, it packs a bitter punch and a lovely crunch that let’s you know this is 100% pure! Organic Cacao Powder 100g – Mix this into your warm coconut milk with a dash of cinnamon for a healthy alternative to sugary hot chocolate or use in chocolate baked goods! 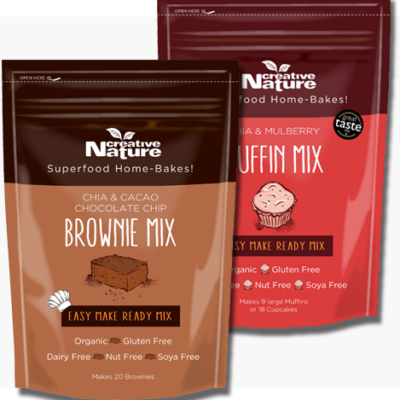 Organic Chia & Cacao Brownie Mix – Super easy to make and without the nasties of traditional home-baking mixes, this is great to hand out at parties! Cacao Orange Protein bar x 5 – A marvellously indulgent bar to enjoy post workout to replenish your muscles. All the flavour of a dessert bar, none of the added sugars, nuts or dairy! Raw Cacao Superfood bar x 5 – A Great Taste Gold Star winning snack bar with cacao powder and nibs to boost antioxidants. A great bar to have before a workout or as a midday snack. 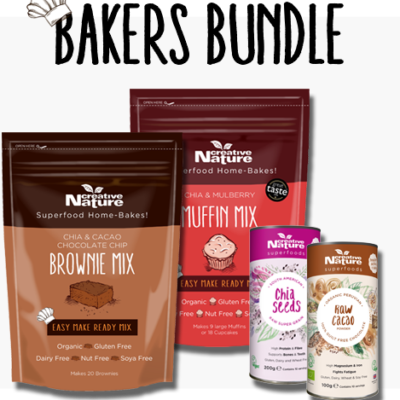 All of the products in this bundle are free from gluten, dairy, wheat, refined sugar, sweeteners and nuts. They are all certified with The Vegan Society and The Vegetarian Society. The organic products are certified with The Soil Association. Customer notice – We are doing a soft launch of phasing in our new packaging for our superfood tubs, as we want to keep wastage to a minimum and help the environment. You may receive new packaging or old packaging but rest assured the product inside is all the same. You can use our Chocolate Creation to make our beautiful Chia & Cacao Brownies and many wonderful home-made treats such as smoothies, chocolate porridge and cookies! Make sure to check out our Instagram page to see some amazing recipe ideas created by our customers and bloggers. You can also visit our Recipes section of our website to get some inspiration!